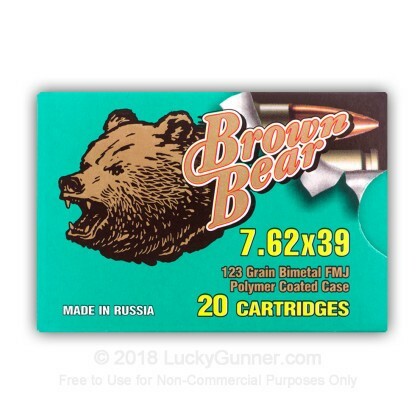 Brown Bear's 7.62x39 FMJ Cartridges are polymer coated for reliable, smooth feeding and extraction. 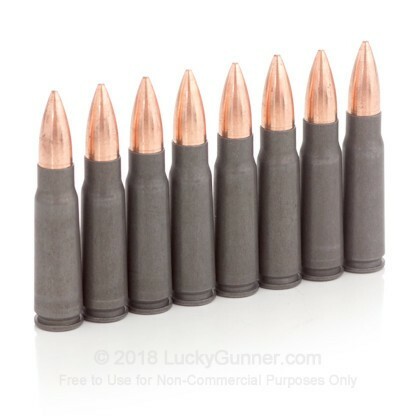 These rounds are an excellent and economical choice to keep your Kalashnikov well fed at the range. 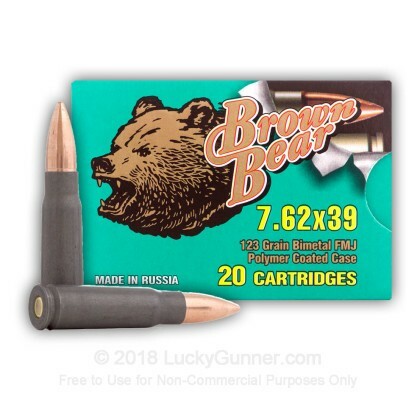 Manufactured in Russia, this product is great for target practice or range exercises. It is polymer coated steel-cased, berdan-primed, non-corrosive and non-reloadable. Ordered a case for the range, package arrived discrete, intact, and way quicker than I’m used to for ammunition orders. No issues with the ammunition itself, and I will definitely be ordering more in the future. Check with your local range. Mine wont allow steel cased ammo. Used this ammo for first time for my SKS. Hadn't fired it in over 15 years. Fired off about 120 rounds without any issues. Hit steel target at 100 yards with ease. Would deff buy these rounds again. Fast service , great product , husband very happy ! Loaded and cycled very well. Accuracy is what it is. Can hit paper plates at 100 to 150 yds. Good job,Lucky Gunner! Received my ammo on time and it performed excellently! You certainly have a repeat customer! Fixing to order some more time meow!!!!!!!! After hearing hichock45 rant and rave about LG, I figured what the heck. Order was received in a very short and was exactly what I wanted at the right price. 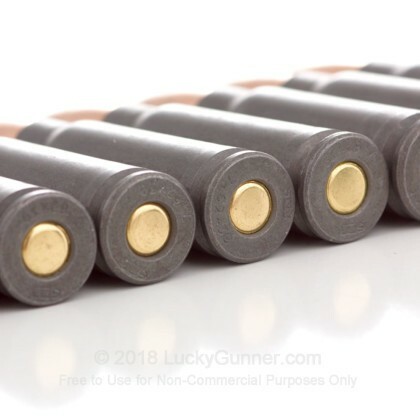 Excellent ammo , and price. Excellent ammo , and excellent costumer service . Long live to Republican Party . God bless our USA. Thanks lucky gunner. Price was good, shipping time excellent, and ammo worked perfectly with no failures. first time ordering ammo from Lucky Gunner, Ammo arrived on time and shot really nice out of my AK-47. I would and will order more amoo when it comes in. the ammo was priced at an excellent price and when they have more and offer it at that price I will buy more. The price is amazing, and the ammo work really well. I have had no issues with it and I will most likely buy it again in the future. This is a great site and a great product. Great product at a great value from a great company! Just bought more ammo for the ak and did it come fast. The price, availability and service can not be touched. Thanks. Outstand value, super fast shipping. No firing issues! I will be back. 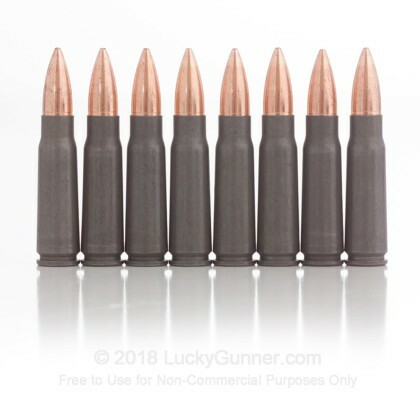 Excellent ammo with zero failures. Best Price, super fast shipping and delivery. Lucky Gunner is the great seller with the best products!! I am delighted with this excellent ammunition. The price was among the lowest I could find and the shipping was fast. I'm going to miss the exceptional and low-priced Russian ammunition when our government decides to ban them. In the mean time, thank you Lucky Gunner for making them so affordable. Very fast shipping and great value. Will buy again. Went to the shooting range and shot a few clips with this ammo and didn't have any issues with it. It's a little dirty when I opened the AK but good ammo. This is my second purchase of this ammo, it's great and lucky Gunner have fest delivery and great price. So far I have shot about 140 rounds of this ammo without failures, seems to be uniform in there loading, can't complain. Shipping was Ok as was customer service. Great price, fast delivery and great quality. 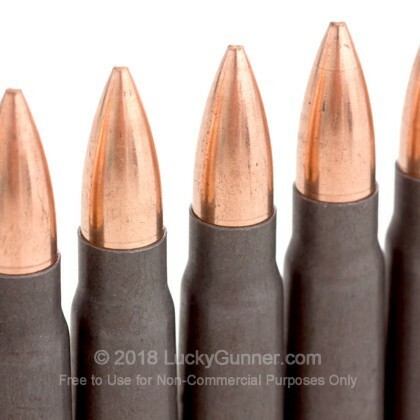 Good clean ammo with zero failures. Lowest price around and super fast shipping. Luckygunner is the best !!! 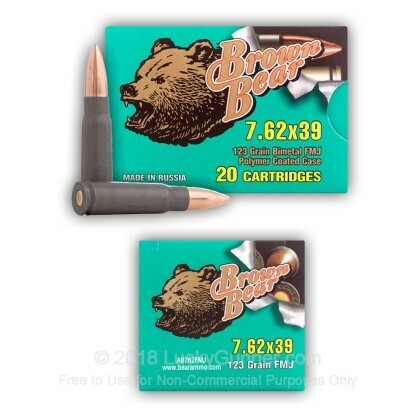 Good deal, have had no issues with this ammo at all! Price was great and perfect for the range! Makes it affordable to go to the range and have some fun. The first Brown Bear I've tried,hasn't misfired yet. Shot well in surplus and polymer mags. 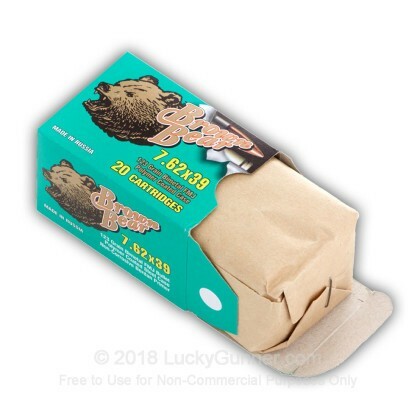 Lucky Gunner is the best, in stock ammo, fast delivery, good products. As always, ordering on-line was quick and easy. Shipping was lightning fast. Received my ammo in three days (standard shipping selected) and at the range that weekend breaking in the new AK. No issues at all at the range. Everything fed and fired without a hickup. Got to love the price too. Thanks Lucky Gunner! Fast shipping. 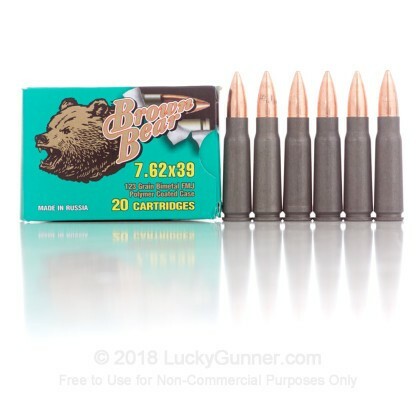 Good ammo at good price. I will buy again..
Lucky Gunner is a great company that offers great prices with lightning fast shipping!!! Delivered in time for a good price.. The ammunition was shipped promptly, in a "plain brown box". It worked fine. I am pleased with the transaction, and would unhesitatingly recommend them. Quality is great. I strictly buy Russian surplus for my AK because it's cheap and eats it all up. And of course price was great thank you Lucky Gunner, you will be pleased to know I will buy all my ammo through you as often as I can. Great prices and quick shipping! 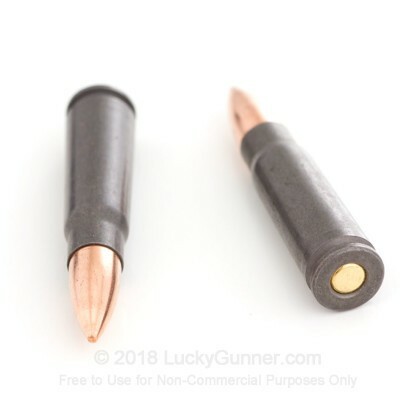 Yes is cases are steel, but so is this ammo...get it, because its a good deal. A: Hello George, This ammunition is loaded with a bimetal jacketed bullet and will be attracted to a magnet! Q: What does AK_47 shoot? A: Hello Ronnie, The AK-47 is traditionally chambered in 7.62x39. I would verify this on your rifle just to make sure. If it it chambered in 7.62x39, then you can shoot any round in 7.62x39 and it should function great in your rifle. 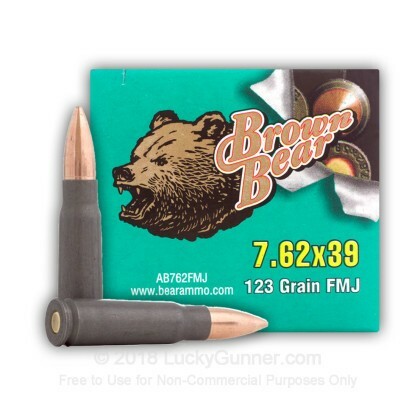 We also have this 7.62X39 - 123 Grain FMJ - Polymer Coated - Brown Bear - 20 Rounds ammo in stock in a smaller quantity.